It has happened a number of times since I began my career in investment management. The topic of investing is brought up in conversation and it is immediately compared to gambling, where the odds are stacked against you and you only win if you are lucky. Both gamblers and investors share some similarities. Both risk capital in hopes or expectations of a larger sum in return. 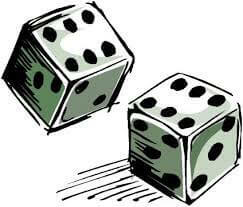 Both must also weigh the amount of capital they are willing to put at risk based upon the odds of winning and losing. In both cases, the higher reward relative to risk, the higher the amount of capital that is typically wagered or invested. After that, the two diverge greatly in their characteristics and ultimately what they seek to achieve. Those who gamble do so for the thrill of it, not for the expected return. They love the thrill of plunking down a large bet and rolling the dice, just as those who speculate and “trade” love to hammer the mouse to purchase a security only to sell it minutes later. The only chance of profit a gambler or speculator has is sheer luck and odds which are always stacked against them. Investors on the other hand are able to stack the odds in their favor through the use of a long time horizon and operating in a capitalistic society. By placing their capital at risk and buying an ownership stake in companies through common stocks they are rewarded when those companies generate a profit and return capital to shareholders. Over a long time horizon the companies composing our broad economy have shown an ability to continuously increase profits and continuously reward the capital that they have used. Taken together, those who invest in broad market indices or high quality companies for long periods of time are likely to be rewarded through both an increase in investment value and the distribution of earnings. Now those are odds I am willing to bet on.